The UK, Germany and France have created a new payments system to allow European businesses to trade with Iran without falling foul of US sanctions. All three opposed last year's decision by President Donald Trump to abandon a 2015 deal under which international sanctions on Iran were lifted. 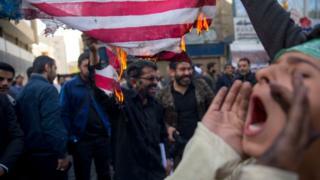 The US said sanctionable activity with Iran risked "severe consequences". Many other existing payment channels have links to the US, which means making payments to Iran is difficult. The UK Foreign Office said the Instrument for Supporting Trade Exchanges (INSTEX), was a "new mechanism for facilitating legitimate trade between European entities and Iran". Foreign Secretary Jeremy Hunt said initially the new payment system would only apply to food, pharmaceuticals and consumer goods, which are not subject to sanctions. In a statement, the US Embassy in Berlin said: "As the President has made clear, entities that continue to engage in sanctionable activity involving Iran risk severe consequences that could include losing access to the US financial system and the ability to do business with the United States or US companies." However, it added it did not expect the new payments system would "in any way impact our maximum economic pressure campaign" against Iran. In 2015, Iran accepted curbs on its nuclear programme in return for the lifting of sanctions. However, last November the US reinstated all its sanctions on Iran. The White House said it was "the toughest sanctions regime ever imposed" on Tehran, targeting Iran and states that trade with it. On Thursday Mr Hunt said INSTEX was "part of European efforts to preserve and support the Iran nuclear deal" and "preserve sanctions relief for the people of Iran". "This is a clear, practical demonstration that we remain firmly committed to the historic 2015 nuclear deal struck with Iran, the Joint Comprehensive Plan of Action, for as long as Iran keeps implementing it fully," he added. He said more work needed to be done to get the system up and running: "That includes work with Iran to establish the necessary counterpart structures." Earlier this month the EU announced fresh sanctions on a unit of the Iranian intelligence agency and two individuals over alleged assassination plots. The EU accused them of attempting, or carrying out, attacks within several European countries. Speaking at a meeting of EU foreign ministers in Bucharest Mr Hunt said the Iran nuclear deal remained "central to international efforts to halt nuclear proliferation and is crucial for the security of the region". "But we are clear; this commitment does not in any way preclude us from addressing Iran's hostile and destabilising activities," he added.